Our support system allows you to use your Gradwell login to view your open and closed support requests. You are able to see who is currently assigned to manage your request and the status of your ticket. Notifications will still continue to be emailed to you whenever there is an update from a member of the Gradwell team. To login to the support area, click on Sign In in the top right hand corner of any page in our customer knowledge base. 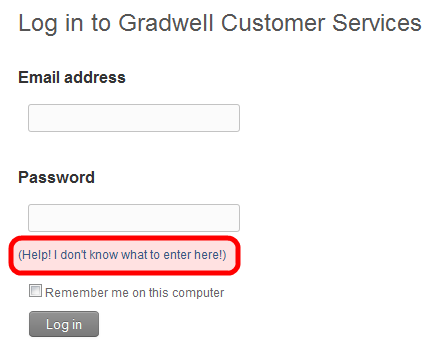 Enter the same username and password that you use to access your Gradwell control panel and click Login. You can see all open support requests that you have sent in to us from the primary email address on your account by clicking Check your existing requests from the top menu bar. From here you can also view historic cases by clicking View your recently solved and closed requests. If you have sent in a request from a different email address to your primary account address, navigate to the login page as described above and click on If you contacted us from a different email address to this then please instead login here (within the green box). You will be prompted for an email address and password. If this is the first time you've logged in, click Help! I don't know what to enter here and enter the email address that you send the support request from. An email will automatically be sent to that address with a link to create a password.